We offer you a quaint Bed and Breakfast with all of the convenience and comforts of home without the worries. Built in 1900, Wanchese Inn Bed and Breakfast is nestled in the heart of Wanchese on Roanoke Island. Wanchese, North Carolina is a quiet, old fishing village. It is a friendly, relaxing community close to the beautiful Nags Head beaches. Wanchese Inn offers many comfortable ways to spend your day. Start by enjoying a delicious full breakfast in the dining area or savor your morning coffee from a cozy rocking chair. You can lounge in the den reading your favorite book, or experience the slow pace of the village from one of the many porches. We provide wireless internet for surfing the web or keeping up with your business while on vacation. We have plenty of parking space for boats and trailers. Spend your day swimming, boating, kayaking, hang gliding over vast sand dunes, or just doing nothing at all. We provide beach chairs and towels for your convenience. If you travel with your pet, we provide assistance in pet boarding at Roanoke Island Animal Clinic. 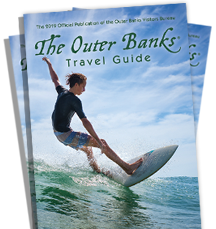 Should you decide to spend your day away from the inn, there are many area attractions to choose from on North Carolina’s Outer Banks.